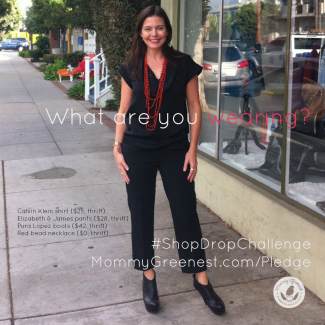 If you’ve been following Mommy Greenest this month, you know we are in the thick of the 2014 Shop Drop Challenge, in which we’re creating a community of women who have pledged to buy no new clothes or accessories for the 30 days of January and are inspired to thrift and swap their style this month. This group is on the list for an exclusive party in Los Angeles later this month. Want to join us? Sign up! I’ve been buying second-hand clothes pretty much exclusively for a few years now, and yes there are environmental benefits, but my reasons are mostly selfish: I’ve been able to upgrade my closet for a fraction of what I would pay in a store. But for those of you who aren’t used to thrift store shopping, here are a few rules to remember. If we all started thrift shopping for one month, we could save nearly $10 billion and one billion pounds of landfill waste. #ShopDropChallenge! 1. Look for wear and tear. You can’t assume that the salesperson doing intake has checked the garment for little rips and snags—you have to do that. Yes, you can find clothes in pristine condition—in fact, I’ve bought a lot of things that still have their original tags—but the responsibility is on you to make sure they’re up to your sartorial standards. 2. Establish a return policy. Thrift shopping isn’t like going to Nordstrom’s. Because the clothes are pre-worn, it’s difficult for a salesperson to determine wear and tear after you’ve brought it home—most stores are reluctant to take items back once you do. 3. Enjoy the hunt. Once you start thrifting, it can become addictive—mainly because of the feeling that you get when you find something that is 1. Unique and 2. Saved you a boatload of money. Case in point: The Calvin Klein silk shirt ($25, thrift), Elizabeth and James trousers ($28, thrift) and Pura Lopez boots ($42, thrift) that I’m wearing with a swapped red bead necklace in this photo. 4. Wash before you wear. One of my favorite thrift store phobic friends explained her aversion by saying, “I don’t like other people’s dirt.” Me, neither. That’s why I absolutely, positively wash every single item of clothing—including wiping down shoes with non-toxic wipes—before I wear it. No exceptions. Update 1.13.14: Found this Louis Vuitton bag on I-Ella.com and had to share. Yes, it’s beautiful. But you still have to check the lining! Throughout the month, I’ll be posting pictures of my recycled fashion finds here and on our Facebook page, and I’d LOVE to see what you’re wearing, too! Add your photos and descriptions there, Insta them or tweet them to me @RachelLSarnoff and I’ll post ‘em for you. You can also email me at info(at)mommygreenest.com. Remember to hash tag #ShopDropChallenge! So…what are you wearing today?